KHL rules allow only three NHL players on the roster, hence teams are seeking to extract maximum benefit from their overseas stars. 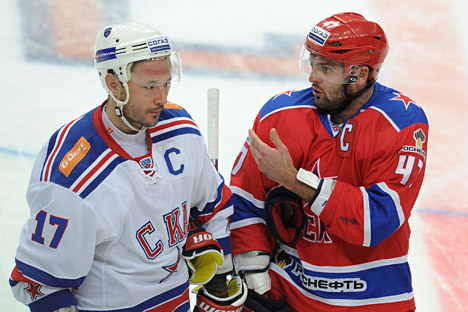 NHL lockout provides timely dose of talent for KHL. The second “invasion” of NHL players from across the pond is very different from the experiment that took place three years before the emergence of the Kontinental Hockey League (KHL) in 2004-05. Back then, the overseas NHL contingent was more powerful, with over fifty big-name players on Russian squads. Kazan's Ak Bars team assembled the most fearsome squad in terms of names and numbers, but eventually capitulated in the championship quarterfinals. Many stars were not up to par, either during the regular season or in the playoffs. The situation how now been flipped. NHLers on Russian rosters are likely to make a difference from the start – not because coaches and managers want it, but because their stats and performances merit it. The previous NHL lockout failed to deliver for many clubs, so this time they have decided not to recruit from the North American league. The KHL's first champions – Kazan's Ak Bars and Ufa's Salavat Yulaev – have done just that. Yet, their encounters with NHL-enhanced teams indicate that the other extreme should also be avoided. “We are pleased with our NHLers,” said Yuri Lukin, general manager of Yaroslavl's Locomotiv, in an interview with Izvestia. “Our principle was to bring back the very players who left Yaroslavl in the first place for the NHL. The circumstances don't matter; what matters is that they return.” And they did indeed return, but with no preparation and no preseason games in their belts. Nevertheless, as professionals, they knuckled down and started producing results. It still makes no sense, however, for Russian clubs to buy wholesale: How can you put a team together with 12 new signees? That is the experience from the past lockout. And the rule change requires clubs to be even pickier when it comes to selection. Alexei Zhamnov of Chekhov's Vityaz supports his Locomotiv colleague. “As soon as the NHL guys began playing,” said Zhamnov, “words like 'waste of money' were quickly forgotten,” said Zhamnov. NHL players have been allotted three additional places on each team roster over and above existing NHLers, who do not need to be replaced or discarded. KHL clubs have pinpointed the areas where they need reinforcements and signed players that will mesh well with the current team line-up. This can only benefit the league and Russian hockey in general. Experts note that KHL regulars have improved their game through playing with NHLers, as well as against them. Vladislav Tretiak has noticed a particular trait of NHL goaltenders that could come in handy for Russian goalies, too. According to Tretiak, Russian NHLers will be on hand in December to put some swagger in the step of their compatriots on the national team. The head coach of Team Russia, Zinetula Bilyaletdinov, plans to use many of them in the domestic round of the Euro Hockey Tour. Russian NHL Players Guide by RBTH will be released soon! The Guide will help the hockey fans know more details about the Stanely Cup playoff season. Readers can download this app in October 2012.